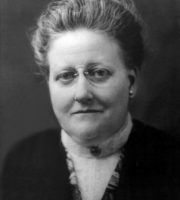 Amy Lowell was born in 1874 on her family’s estate, Sevenels, in Brookline, Massachusetts. The youngest of five children, she developed an affection for books and a love of reading and writing at an early age. Lowell and her mother, Katherine, composed and published a book of stories and poetry called Dream Drops; or, Stories from Fairyland in 1887. While she seemed diligent in her studies of literature, Lowell’s schoolteachers reported her as undisciplined and a troublemaker, teasing her classmates and disrespecting those in authority.